Rotary is an international organisation creating opportunities for professionals and those in business to use their vocational skills in assisting their communities the world over. Rotarians contribute time and expertise to make a difference – helping those who need it and encouraging youth to reach their potential. If you’ve ever asked yourself ‘What can I do?’ ‘join Rotary’ may be the answer. Rotary International is a global network based within local communities providing aid and assistance throughout the world. An example of an ongoing international Rotary project is the universal eradication of polio by ensuring, among other things, that all children have access to immunisation. Rotary International is one of the world's largest service organizations with 32,000 autonomous clubs in 166 countries, all providing an up-to-date and progressive representation of a community's business, vocational, and professional interests. Rotary was founded by Paul Harris in 1905 in Chicago, USA. There are more than 1.2 million Rotarians world-wide in over 150 countries – a new Rotary club is established somewhere in the world every 12 hours! Rotary has a seat in the General Assembly of the United Nations in recognition of the efforts of its membership to foster goodwill and peace across national boundaries. Rotary is the world’s largest Non-Government Foundation providing educational and humanitarian aid. Rotary is non-political and non-religious, recognising the needs of all people to work together to achieve world-wide peace and prosperity. The power of Rotary comes from club membership. Each club is chartered by Rotary International with an approved constitution. Clubs are autonomous and make their own decisions regarding initiating and supporting projects. This autonomy allows for wide diversity between clubs around the world while they maintain principles in common and dedication to “service above self”. Each club elects a President for a term of 12 months so that all members who wish to serve through leadership have an opportunity to direct the club’s activities. Rotary clubs have a board of directors representing essential tasks and committees. A Rotarian is a member of a Rotary Club that adheres to Rotary principles of service through friendship. Members are asked to contribute their skills and talents towards projects to benefit the community. A Rotarian is always welcome as a visitor at any Rotary club anywhere in the world – this opportunity to sample hospitality and share companionship with others from many cultures is a major benefit of membership. Individual effort is a fine thing but there’s no limit to what can be achieved by working with others – as a Rotary Club member you enjoy the benefits of forming a wide circle of friends while using your skills to make the world a better place. As a Rotarian you represent your industry or profession or community within your club, ensuring that project teams comprise members from a variety of backgrounds and vocations. Rotarians agree on the need to maintain high ethical standards in their lives, and to promote goodwill and encourage peaceful coexistence at all levels of society. Clubs aim to continually expand their membership. 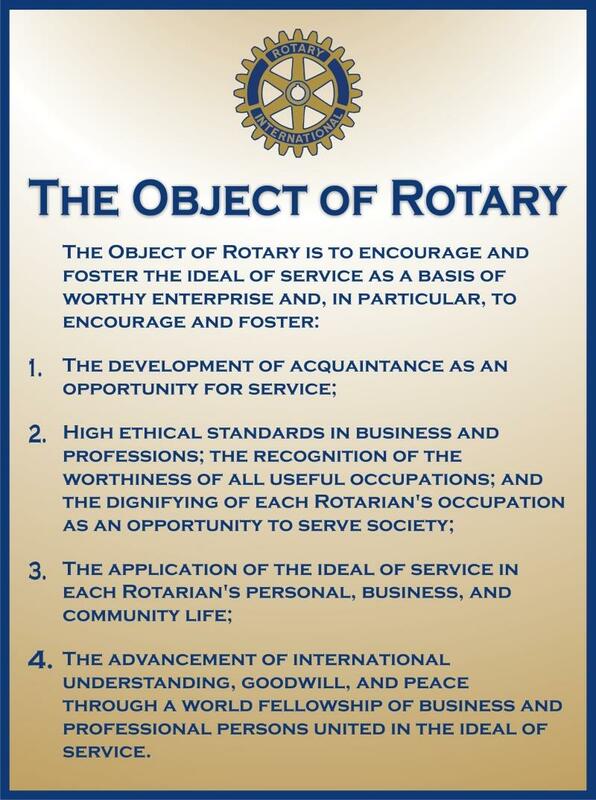 What does a Rotarian do? Each member contributes time and skills to work on projects as part of a team. Your skills may include leadership, project management, organisation and people management, creativity and innovation, communication, technological skills – your desire to lend a hand is the most useful thing you have to offer. Training young people in problem solving techniques, leadership skills and stress management helps them cope with a world of great expectations coupled with high unemployment. Involvement in projects which beautify or conserve our community’s environment, demonstrates our commitment to future generations. Showing compassion and assisting those less able to cope in our society due to temporary or permanent disadvantage works towards preventing a divisive ‘them and us’ attitude in the community. Projects like these can enrich the lives of many and often require only small amounts of time and money. Rotarians believe it is important to use our talents to bridge the gap between those with less than ourselves, to bind our community together and create common goals and aspirations for a better society. Members contribute to Rotary according to changing demands of family and work commitments. Rotary as an organisation recognises the need for members to place family and employment ahead of volunteer activities. Our Club meets weekly throughout the year over dinner to hear guest speakers address varied and relevant topics. Members are encouraged to also work on one of the club’s project committees or take up a Board position, meeting once a month to plan and report on projects under their direction. Each club determines its own focus and the members agree on the projects to be undertaken. You will decide where in the Club your skills and talents are most useful and what would be of most interest to you. You will then join the committee(s) that best suit your skills and interest and make things happen and thereby achieve success as a member of the team!